My wife and I glued up finger joints. 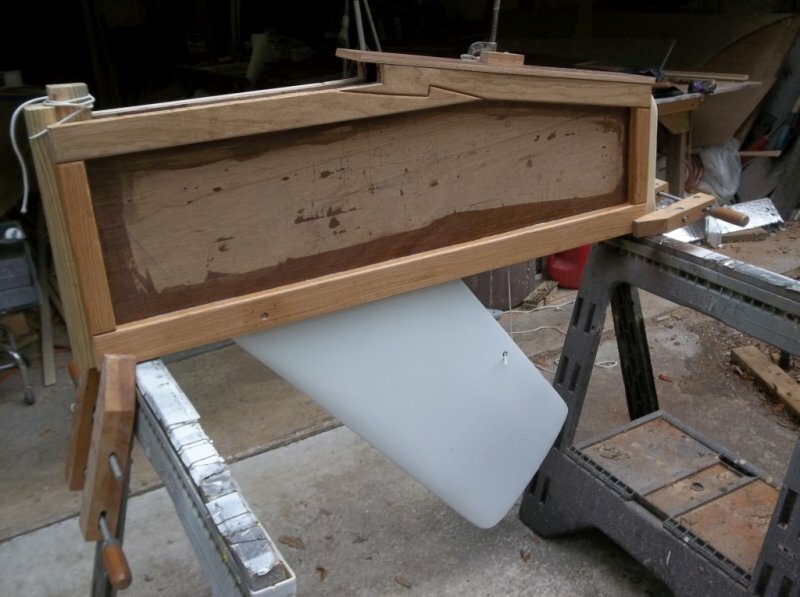 I flattened the workbench with a handplane and put plastic down. We pushed the joint together, clamped the pieces to the workbench and then put weight on the joints. They came out good. I think I will use this same technique again. I also started cutting stringers. 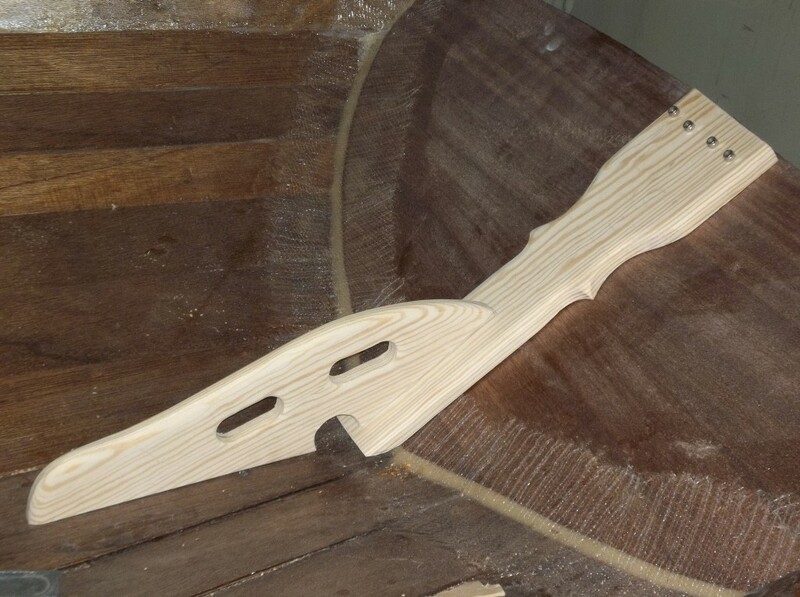 I got my son involved when it came time to roundover the stringers; showed him how to change bits in the router table and then he got to practice on scrap wood. I didn't let him rout the actual stringers since it would put his hand too close to the bit. I'm ready to close up the centerboard trunk. I have not built my centerboard yet. Should I complete the centerboard before I close the trunk? I'm planning on using a piece of foam to act as a centerboard bumper. Should I epoxy the foam in place now or is the foam just jammed in and held in place with a friction fit? I'm not sure there is a right way. I built my centerboard from scratch, so the thickness was up to me. Therefore I built if first. But if you have one from the kit, I'd assume you know the centerboard pivot bolt location and everything else will be fine. The only thing to worry about is if the sides of the trunk stay parallel when you glue the module down. I put a spacer in mine during the gluing but after I glassed the inside of the tanks the panels got pretty rigid. The only thing I did when I put in the module was to hold a straight edge on both sides to make sure they weren't bowed. It's important to build the case square and plumb, which is easier on a bench. It's also important to insure the board fits neatly and fits inside plumb with the pivot. Simply put, I like to test the whole assembly, before it goes in the boat. This is me testing a trunk and board assembly. It's not completely glued together, just in case I need to adjust something, but is a "prove of concept" approuch. This isn't a B&B design, but the same still applies. The case is in halves, with the king posts attached, but the cap temporarily clamped in place, which holds part of the hoist tackle. The forward part of this case fits under a deck and the forward king post is yet cut to fit, but the board is plumb, rides up and down neatly and the tackle does what it's supposed to do. At this point I feel safe to install the assembly, knowing I don't need to make any additional alterations of adjustments, which are a lot harder once the assembly is bonded into the boat. It's your call, but I'm reminded of a buddy that built a CS-17 a few years back and he elected to drill for the pivot, after installing the case in the boat. His logic was to drill the case and the board all in one shot, insuring alignment. Well he couldn't get a drill and big bit down into the belly of the boat, because of the deadrise of the bottom planking. I bailed him out by showing up with an angle drill, which his puny compressor could barely spin to speed, but we got it drilled eventually. Again, it's a lot easier to work on this out of the boat, then in. Makes sense PAR. That is a really cool joint in your centerboard case; very elegant. Thanks, but it was a cheaper way to solve a problem then using the 1x6 I actually needed, to span the space. I didn't want the weight of the 1x6, so I would have cut much of it away, but I'd have had to bust into nice stock for 40% waste, so I used 1x4's instead, with maybe 10% waste. If you look closely, you'll note the joint is rounded over (they all are), which is another cheap bit of woodworking and effectively hides, less than perfect fits. The fits were good, but not deadnuts, so I hit them with a roundover bit, before assembly. 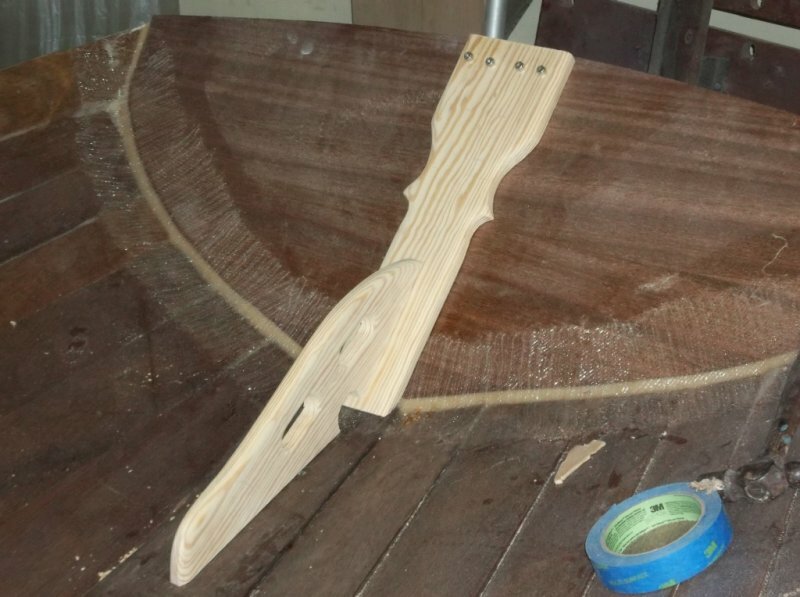 This is a transom support and also backs up the through fasteners for the rudder hardware. It simply could have been a plank and a knee, but I was in a mood . . ., if you have to do something, that will be exposed, you might as well make it look intentional and if possible good looking. That "knee", though! I likes it. I have glued up all the cleats necessary to complete the module. The weights wouldn't balance on the narrow cleats, so I used extra cleat stock and "bridged" over to put weight on the glued cleat. I cut the cleats to length after glueing them. My daughter got some math practice with the tape measure. She enjoyed using the jigsaw to cut the wood to rough length. After flattening the workbench with a hand plane I clamped some cleats down to the workbench. Question: is the module initially glued together with "tack welds" only after checking for square, or do I need to put epoxy in the joints themselves during the assembly? Do I need to put epoxy in the rabbits and slots during assembly? I got the module assembled, aligned, and tack welded. I had quite a few cleats that were slighly misalinged, I had to take it apart, tweak cleats and cleat cutouts on the plywood, and re-assemble the module mulltiple times. The faults were all mine, the kit and directions were excellent. With help from a neighbor I lifted up one end of the module, inserted the sole from underneath, and tied it up temporary in place. It was great having a workbench large enough to support the module (I did flatten the bench with #6 plane and check it for twist using winding sticks before using it). You will make insertion of the cockpit module much easier and with a better fit if you would assemble the hull BEFORE glueing any of the [cockpit] module pieces that contact the centerline or the chines. The source of this advice is Graham's caution to me when I picked up the assembled hull (i.e., bottoms & side panels) with Blks 1 & 2 filleted and glassed in-place but the transom [only] wired. He cautioned: "Be sure to trim the bulkheads and bunk supports to fit well at the fillets on the centerline and the chines before assembling the module." Those were heavy (i.e., thick) fillets and each bulkhead and bunk support needed substantial trimming. So too, to a lesser extent, did the notches thru which the "stiffening" longitudinals on the bottom and side panels pass. If this isn't done [before making them a permanent part [of the modue] -- it will have to be done later -- which will be much more difficult and less accurate. I noticed from your photo of the inverted module that the bulkheads and Ballast Tank / Bunk Suppof (part #46) have not been trimmed at the centerline and the chines. If you haven't already glued them [in place] as a permanent part of the module, you could put the module aside and tackle the hull assembly. Just a suggestion -- based on Graham's advice and my experience. When I inserted the module, it just dropped nicely into place with no need for trimming. I'd also suggest very careful alignment re it being centered and perpendicular to the hull centerline. Just a tiny bit misalignment can mean that error multiplied at the boat's topside. When I inserted "Chessie's" module, it dropped in-place as it passed one of the longitudinals with a nice "thunk." It looked so good, that I didn't make any alignment adjustments. Later (after gluing it in place) I noticed the small gaps between Blk 4 and the side panels were about 1/16" bigger on one side than the other. In hind sight I'm sure that I could have nudged the module 1/32". Correcting that slight error would have helped to also correct a small error as to the module being perpendicular to the hull centerline. Thank you for the great advice Pete. Unfortunately I have already tack welded everything in place. Thanks for making me aware of the trimming I will have to do. The manual reccomends assembling the module before unfolding the hull, so that is what I did. My dad is going to come up and help me unfold the hull and insert/fit the module; I'm sure we will get quite a workout! I will heed your advice regaring aligning the module to the centerline at that time. Question regarding fiberglassing the module: does it matter where the fiberglass intersects? Where should the 6oz fiberglass cloth intersect the fiberglass tape? Amos,... Just a suggestion. When your hull is unfolded and ready for the module insertion, at that point you could mark and cut templates out of cheap 4 mm ply of the profiles where the module bulkheads and bunk supports will have to go. Then transfer them to your module. It's an extra step, but not that much extra trouble. And remember, a bulkhead that is trimmed a little too much can be corrected with a shim and/or some extra epoxy gap filler. But finding a bulkhead "too high" will probably require removing the module in order to trim off the extra material. And, frustratingly, with that "high" point removed, you'll probably find another "high" point. I don't think it matters that much. The fillets and tape are for the dual purpose of strength and to prevent any water intrusion. The FG on the other surfaces is mainly to prevent water intrusion -- so cover as much as you can and apply extra epoxy coats where there is no FG. And, before insertion of the module, I laid out 10 oz FG on the hull under the ballast water tank and then applied 2 coats of neat epoxy to the entire inside of the hull. You have to remember to rough up (#80 sand paper) all areas where the module will touch the hull. I had this in my "to-do" list -- but forgot it anyway. Didn't remember until after insertion (but fortunately before any tac welding). Had to raise up the module in order to properly prep the previously epoxied hull interior. Also, put on your prep to-do list, to epoxy (and then rough up) the edges of the module that will be making contact with the hull. I really like the template idea; I could get the template close and then run the point of a pencil inside of a small washer to transfer the profile of the hull to the template. Thank you for the answer on the fiberglass. I did not tape the corners of the water ballast. I made a really smooth fillet (sanded after they hardened) in the corners including the stringers. I put the plastic wrapped floor in so I was sure it was square as it dried. I did a two step process being very careful to be neat. I then laid the module on it's side and used gravity to assist putting pre-cut glass cloth to port, then starboard, wrapping the glass up around the bulkheads and filleted stringers. It was easier than I thought. I would go back after the epoxy gets a bit green and make sure you don't have any bubbles. I got a couple I just cut out later. When it dried I went back and roughed up the edges on the front and rear bulkheads to be sure the fiberglass that covered these panels blended good. My big Dewalt orbital sander fit in good, but I did have to use a multi-tool sander and a sanding block to get it good before I glassed them. I trimmed the tops and bottoms with a knife. As the directions show, there was some gaps on the top that I filled with warmed resin to be sure there weren't any places that could hold water after the seal. I glassed the floor like Chick and Pete, so after corner taping the aft dry compartments I used Epoxy to end seal all the plywood's edge that would be down as a precaution. My module is filleted in, but I do need to tape it to the bottom at some point. If you go back and read my building thread, you'll realize I had a few problems getting the module to fit perfectly because I clothed the bottom panels and put the heavy cloth on first and didn't trim the bulkheads to fit before I assembled the module. I spent a lot of time fussing, but most of the issues were from not having my cradle square (it warped over time) If you just trim a bit from the center it should fit pretty good. I'd still follow the same order. Pete's idea of a template is good, but as long as you get it to fit flat outside the center big tape, you can fillet a gap pretty easily if you over trim the center a bit and have gaps. I found that once I put the module in place (and after getting the cradle square) patience and a small plane and a wood rasp got it to fit pretty darn good. It's pretty neat when it sort of becomes a boat and you can sit in it and "shop-sail" a bit. I'm not saying my way is the best way, but I'm pretty happy with the results and I'm pretty fussy. Thank you Steve, that was very helpful. I owe a debt to those of you ahead of me who are making it easier for everyone else. I got the module strong enough to flip it over on its side. We started sealing up the ballast tank area. My son got his first lesson in fiberglassing.